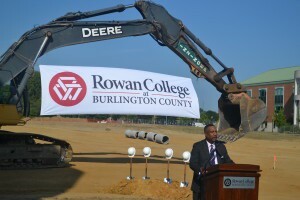 Groundbreaking held for new Student Success Center at Rowan College at Burlington County in Mt. Rowan College at Burlington County President Paul Drayton speaks at the groundbreaking ceremony for the college’s new Student Success Center on Aug 29. The center, expected to open by fall 2017, will measure 78,000 square feet and house most of the student services on campus. Rowan College at Burlington County President Paul Drayton can recall the day in 2015 when officials gathered to announce Burlington County College was entering into a transformative partnership with Rowan University. Now slightly more than a year later on Aug. 28, Drayton and officials gathered to celebrate the latest stage of that transformation with the groundbreaking of RCBC’s new Student Success Center. Measuring 78,000 square feet and set to face Route 38, the Student Success Center has been described by college officials as the centerpiece of the college’s efforts to transition its main campus from Pemberton to Mt. Laurel. With a scheduled opening date of the fall 2017, the Student Success Center will house nearly every out-of-classroom service students could need on the campus, including advising, financial aid, registration, a testing center, tutoring, a cafeteria and a knowledge commons. The Student Success Center project also includes the completion of an already existing looping road that will fully enclose the campus and the addition of about 320 parking spaces. The estimated cost of the projected is $25.4 million. “This building will play a large role by providing all the support and resources students need in one state-of-the-art and beautiful facility,” Drayton said during the groundbreaking ceremony. Drayton said the center would also act as a symbol of the college’s commitment of putting students first and its work with Rowan University to provide students with more educational opportunities. “It will also serve as a microcosm of our hybrid campus that will house students at all levels in their academic careers,” Drayton said. Rowan University President Ali Houshmand also spoke at the ceremony and expanded on Drayton’s words, noting that RCBC had recently become the first community college in the region to offer a “3+1” program. The program allows students to save an estimated $75,000 over the course of their average four-year college career by taking freshman, sophomore and junior level courses at RCBC and then transferring to Rowan University for their senior year. Houshmand said RCBC and Rowan University had a “historic relationship” when it comes to higher education, as the issues of affordability and student debt continue to grow more serious across the nation. “This campus could really behave and act as a high quality, four-year institution offering degrees that are relevant, that are affordable, that are high quality and that can train kids to become productive taxpayers so we don’t have to worry about funding them,” Houshmand said. Burlington County Freeholder Mary Ann O’Brien, who also spoke at the ceremony and praised the new Student Success Center, said she would looking forward to all that lies ahead for the students of Burlington County. “This new Student Success Center will be a standing tribute to all that Rowan College at Burlington County is and will be into the future: an accessible, affordable and first-rate institution of higher learning that all of our residents can be proud of,” O’Brien said. contact RCBC Foundation Executive Director Anika Ragins-Riley at (856) 291–4224 or araginsriley@rcbc.edu.